Introduction to Embroidery: Hand Embroidery - Let's get started!! Tuesday, February 28th, 6 p.m. to 9 p.m. This class is an introduction to hand embroidery techniques. Participants will learn about the materials and helpful tools most often used in embroidery. They will learn how to transfer images to cloth and 5-10 different and fundamental stitches. These stitches make up the perfect mark making vocabulary for drawing with stitch. Participants will come away from the workshop with an embroidery sampler, their own set of embroidery tools and the power to draw with thread! All materials are provided. Just bring yourself! Kate Jackson has been embroidering and teaching art and textile techniques for 10 years. She makes time in each of her classes to cover additional content or techniques that are of interest to workshop participants. Kate is a graduate of the Marterial Art & Design program at OCADU and a member of Studio Huddle. 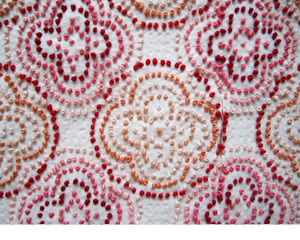 Her own work involves embroidering onto delicate found objects such as tissue, cheerios, and flower petals.